Expedition 58 crew members enter the SpaceX Crew Dragon for the first time. They are wearing protective gear to avoid breathing particulate matter that may have shaken loose during launch. After making 18 orbits of Earth since its launch early Saturday morning, the Crew Dragon spacecraft successfully attached to the International Space Station’s Harmony module forward port via “soft capture” Sunday, March 3, at 5:51 a.m. EST while the station was traveling more than 250 miles over the Pacific Ocean, just north of New Zealand. Less than three hours later, Expedition 58 crew members opened the hatch to the Crew Dragon, the first commercially built American spacecraft designed to carry humans to the orbiting laboratory. As the spacecraft approached the space station, it demonstrated its automated control and maneuvering capabilities by arriving in place at about 492 feet (150 meters) away from the orbital laboratory then reversing course and backing away from the station to 590 feet (180 meters) before the final docking sequence from about 65 feet (20 meters) away. 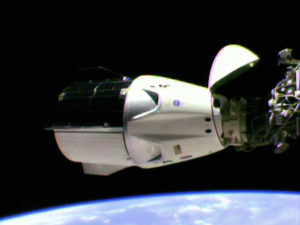 The Crew Dragon used the station’s new international docking adapter for the first time since astronauts installed it during a spacewalk in August 2016, following its delivery to the station in the trunk of a SpaceX Dragon spacecraft on its ninth commercial resupply services mission. For the Demo-1 mission, Crew Dragon is delivering more than 400 pounds of crew supplies and equipment to the space station. 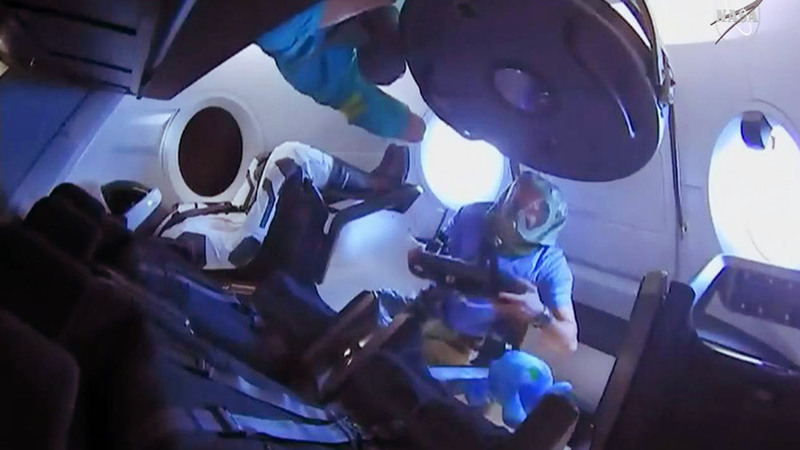 A lifelike test device named Ripley also is aboard the spacecraft, outfitted with sensors to provide data about potential effects on humans traveling in Crew Dragon. The Crew Dragon is designed to stay docked to station for up to 210 days, although the spacecraft used for this flight test will remain docked to the space station only five days, departing Friday, March 8. More details about the mission and NASA’s commercial crew program can be found in the press kit online and by following @commercial_crew and commercial crew on Facebook.